Congratulations to Elaine Gagne and her 2nd place winning story about a very memorable kitchen disaster! Enjoy Elaine Gagne’s 2nd place winning kitchen disaster story! 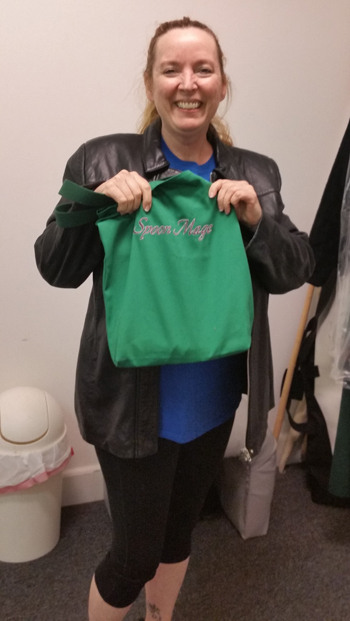 For her submission, she won a gorgeously embroidered handy dandy Spoon Mage™ Tote Bag! Congratulations to Mary Dustin and her 1st place winning story about a very memorable kitchen disaster! Enjoy Mary Dustin’s 1st place winning kitchen disaster story! 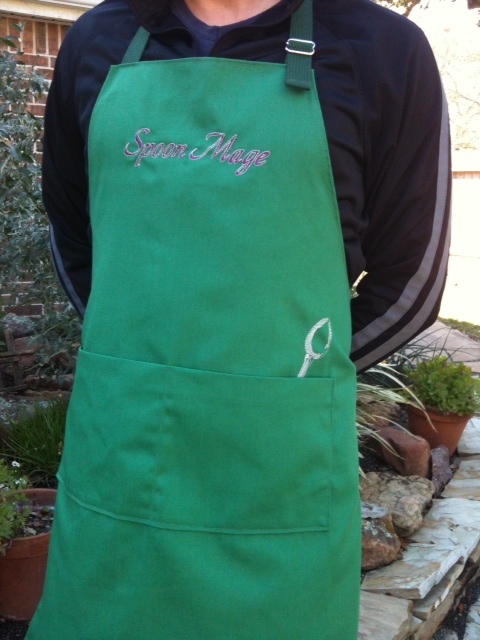 For her submission, she won a gorgeously embroidered handy dandy Spoon Mage™ Chef Apron! Had to chuckle at the exploding grapes of wrath as it reminded me of the time I cooked my dirty dishes. Sometimes mindfulness takes a vacation. 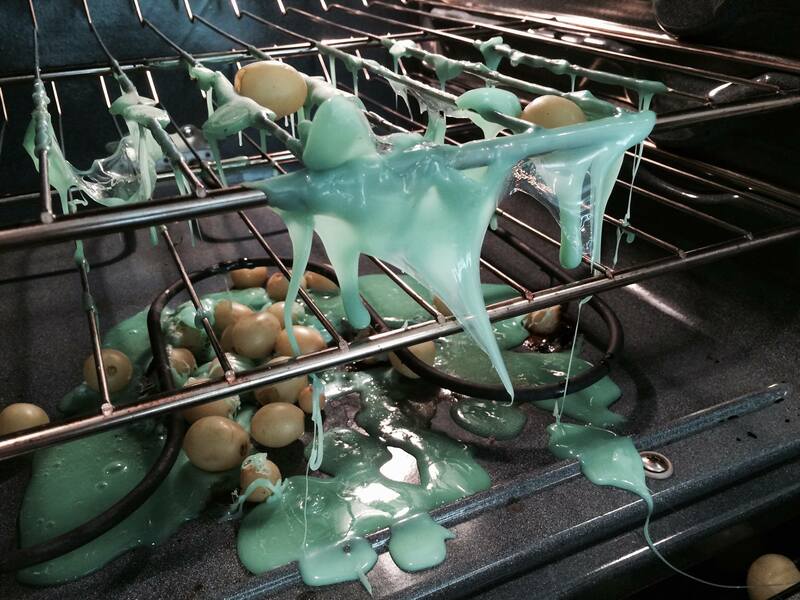 We’ve all had kitchen disasters or mess ups, some messier and smokier than others. When the Spoon Mage™ makes a mindless mess, she does not mess around. The picture to the left is entitled Melted Tupperware with Baked Grapes of Wrath. Cook Like a Spoon Mage™ and Look Like One Too! One lucky Mindful Palate reader will win this wonderful two pocket apron by getting creative with your spoon… and a few green beans. 1. Create a recipe featuring green beans. Any other ingredients are up to you. 3. Email the recipe, a picture of your finished dish, your name, and email address to The Spoon Mage™. 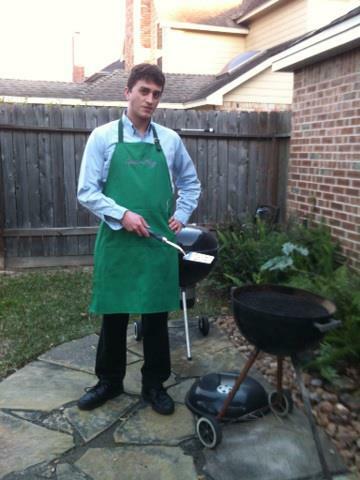 Use the subject line: Green Bean Recipe Contest. On August 31, 2014, the Spoon Mage™ will perform a series of magical cookery tests to determine the one winning recipe!